Liven up your living space with this unique grain patterned rustic cocktail table. Its clean lined base and square live edge table top are the perfect addition to your space. 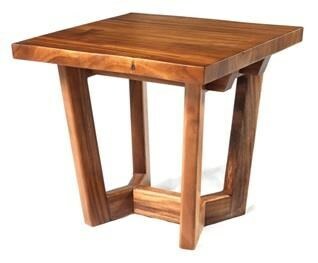 The Santa Fe End Table by Woodbrook Designs at C. S. Wo & Sons Hawaii in the Hawaii, Honolulu, Oahu, Hawaiian Islands, Waikiki, Diamond Head, East Honolulu area. Product availability may vary. Contact us for the most current availability on this product. Tie your living room together with this collection of rustic accent tables. Their unique grain patterns and medium finish fits in great in any space in your home. Live edge table tops give character and pair well with the simplistic clean lines on the base for a contemporary rustic look. The Santa Fe collection is a great option if you are looking for Rustic furniture in the Hawaii, Honolulu, Oahu, Hawaiian Islands, Waikiki, Diamond Head, East Honolulu area. Browse other items in the Santa Fe collection from C. S. Wo & Sons Hawaii in the Hawaii, Honolulu, Oahu, Hawaiian Islands, Waikiki, Diamond Head, East Honolulu area.